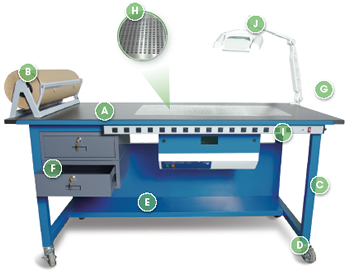 The Evidence-Bench™ series of laboratory work tables are designed specifically for high volume processing of forensic evidence by multiple users. 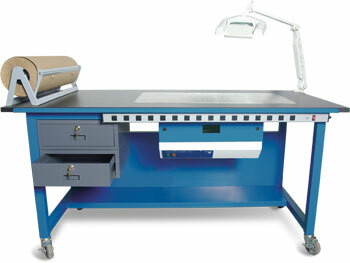 Professional design and construction features offer convenience during use, cleaning, and maintenance. Wheels allowing the bench to be moved throughout the building wherever processing needs to take place. The optional drop-in Airflow Pod permits efficient processing of evidence when using powders and/or chemicals. Based on the Air Science Multiplex Filtration technology, the airflow pod is a high efficiency containment system that protects the user and the environment from hazardous vapors or powders generated at the stainless steel work surface with down flow air movement. Unrestricted front and side access facilitates applications requiring complex and intensive involvement. The Airflow Pod eliminates putrid orders that may be emitted from the evidence being processed.